As we rise, we acknowledge our predecessors and embrace those who will come after us. 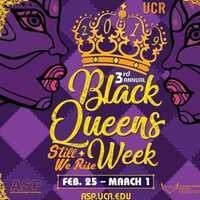 Enjoy a tea party fit for queens while networking with UCR’s black staff, faculty and alumnae. Part of Black Queens Week, presented by African Student Programs.